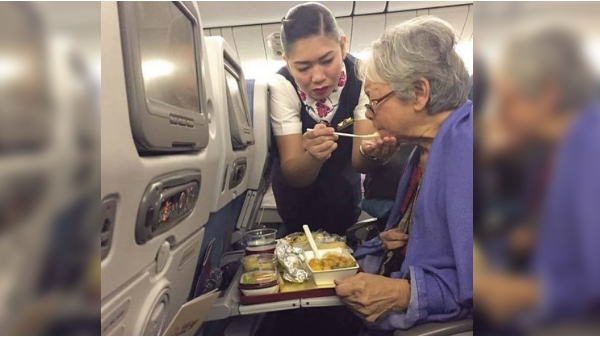 MANILA, Philippines – Netizens went on to search for the anonymous flight attendant who became viral for her kindness and compassion shown to an elderly passenger. Netizens were impressed with the quality of customer service that the flight attendant gave and thanked her for “going the extra mile.” Dajao’s post became viral as more netizens applauded the act of hospitality. Some even called her “extraordinary” and a “blessing” to the old lady who probably had a hard time eating. Following the hashtag FindTheMysteryCrew, the netizens decided to look for the identity of the flight stewardess who took the time and effort to serve the old lady in need. They wanted to give her the credit she deserves. The post has been shared over 30,000 times and with 70,000 reactions. The Mystery Crew is Found! In less than two days, the identity of the “mysterious crew” member was finally found by Dajao. With the help of the netizens, Chet De Guia Encarnacion was named as the viral flight stewardess.